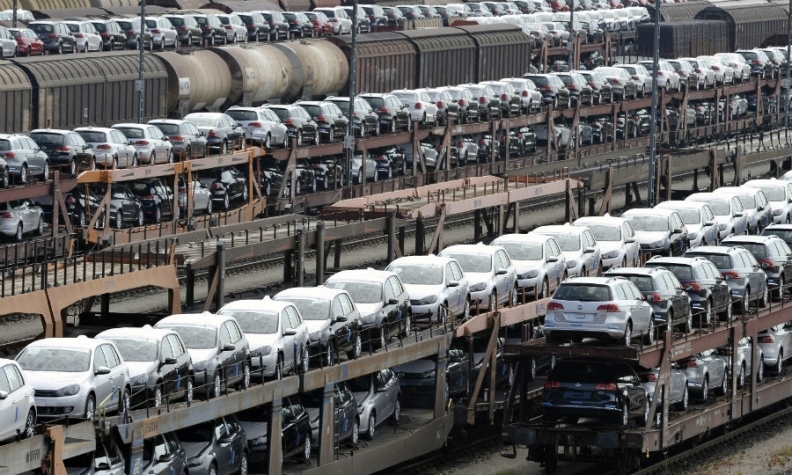 FRANKFURT -- Germany joined France, Italy and Spain in posting higher new-car sales in March, adding to signs that a recovery in the European market is gaining strength. German new-car registrations rose 5 percent to 296,408 last month, driven by gains from the major German brands except for Porsche and Smart, the Federal Motor Transport Authority KBA said today. Sales to private customers rose 3 percent. First-quarter registrations are up nearly 6 percent to 711,753 compared with a year earlier. Car sales rose 9 percent in France to 179,871 in March as the country's stop-and-start rebound appeared to find a firmer footing. Download PDF for German registrations for March and first three months. In Spain, which had been among the countries worst hit by the euro zone debt crisis and six-year sales slump, registrations jumped 10 percent to 79,929 for a seventh straight monthly advance. In Italy, monthly registrations rose 5 percent to 139,337 vehicles. Industry watchers were cautious about the recovery signs. "Spain stands out in the European context thanks to the (subsidies) plan," said David Barrientos, a spokesman for Spain's Anfac industry association. "The next few months are when most registrations happen and will be critical to securing the recovery." Rome-based industry grouping UNRAE warned that Italian growth was driven by unprofitable sales to rental companies and reiterated a call for tax breaks to spur consumer demand. The French recovery has been halting so far with car sales jumping 9 percent in December, only to stagnate in January and February.